When it comes to weddings, anything goes, and one couple soared with this concept for their hyper-personalized, recent wedding. The spouses, known as Jesse and Audrey, shared photos from their big fête on Reddit via Imgur, and commenters lauded the newlyweds for their insistence on remaining true to themselves from first look to last dance. But it was including their dress code for the guests that generated the most buzz, because the attire ask was atypical of most weddings. And indeed, Audrey’s gown stood out. While most of her friends attended the nuptials in layers of tulle, silk and lace in tones of white, the bride was resplendent in a light blue, long-sleeve gown reminiscent of the popular Disney characters from Frozen and Cinderella. The multiple wedding gowns weren’t the only anomaly at the wedding, however. As Jesse explained in his post, he and his groomsmen wore tuxedo print hoodies, which looked both comfortable and stylish, and both of their mothers acted as flower girls in the ceremony itself. At the reception, the couple showed off their fun-loving spirits with skee ball and a number of arcade games for guests both old and young, as well as a “sugar bar” that featured a smorgasbord of movie theater candy for an extra burst of energy. Other highlights included a French Fry bar, an awards ceremony with fun categories like best costume, best dog not in attendance, best mother of the groom, and 18 unique wedding cakes decorated by their guests and the wedding party at the rehearsal dinner. “We threw the wedding we always wanted to go to, and we think it was a great success!” Jesse wrote. Want to personalize your own wedding? Secure your ideal vision by starting with The Knot’s Style Quiz, here. 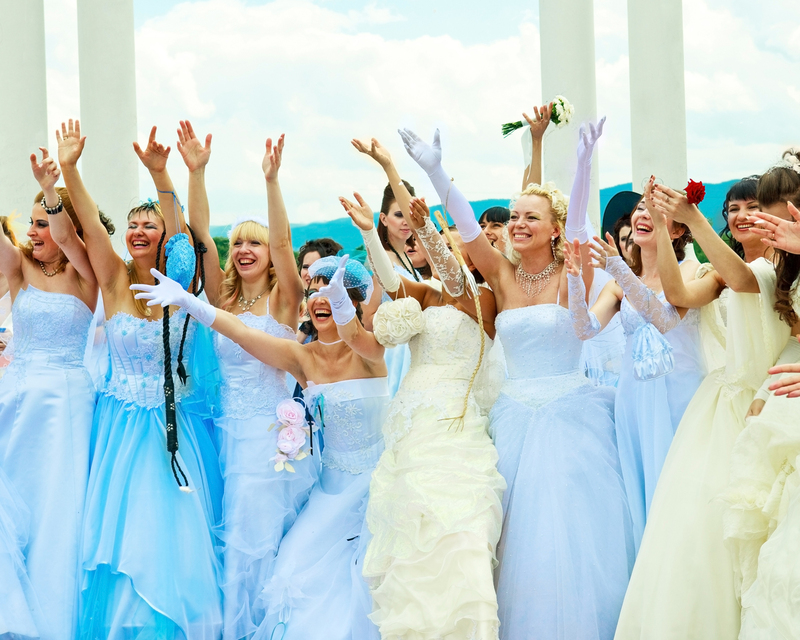 Be the first to comment on "Couple’s “Unusual” Wedding Dress Code Requested Guests Wear Bridal Gowns"